Writer Lila Emerson enjoys a comfortable, if nomadic, existence as a house sitter. When in Manhattan, she entertains herself by watching the neighbors through their uncurtained windows and making up stories about them. It’s a harmless hobby until she witnesses one of those neighbors being murdered. Ashton Archer, a successful artist, is the go-to guy for his extended and somewhat dysfunctional family. He has so many siblings, half-siblings, and step-relatives that he needs a spreadsheet to keep up with them, but his affection and concern for them all is one of his defining traits. When his brother Oliver appears to have killed his lover and then himself, Ash refuses to believe it. He goes to the police station to pick up Oliver’s effects and meets Lila, the sole witness to the woman’s murder. Ash’s need for answers and Lila’s compassion for his pain bring them together. Lila joins Ash in his quest to find justice for his brother. Their search is complicated by a priceless artifact Oliver secretly sent to Ash. They soon realize the artifact and others like it have left a trail of blood behind them, and a ruthless man will stop at nothing to obtain the one Ash now holds. This latest outing of Roberts’ is a little different from her recent releases. It’s set mostly in New York City instead of in a small community, and she uses the urban hustle and bustle at key points in the story. The plot is also different in that it’s tied to historical mysteries and legends. Last year’s Whiskey Beach used a family legend, but this story looks at a broader historical stage. It plays nicely off of the story of the Grand Duchess Anastasia, thought to have survived the massacre of the Romanovs until DNA evidence demonstrated otherwise, and the priceless, lost eggs created by Fabergé for the tsar’s family. Ash and Lila are engaging and sympathetic. Lila, who grew up on military bases, carries a Leatherman multi-tool and prides herself on her independence and her ability to fix almost anything that breaks. Ash runs his family’s personal affairs but not without periodic exasperation. His determination to have justice for Oliver and Lila’s desire to help are believable, as is their attraction to each other. The secondary relationship in the book involves a high degree of coincidence, which will bother some readers and not others. Some may not like the fact that Ash, like Seth Quinn in 2004’s Chesapeake Blue, is a young and phenomenally successful artist who intends to paint the woman he’s attracted to. Others won’t care. The opening of the story is a little slow, perhaps because Lila is content, with no hint of any looming problem. Once the murder occurs, however, events move along at a good pace. Ash and Lila’s strategy for dealing with the man behind his brother’s killer is clever and credible. The biggest group of secondary characters are the Archer family members. They have various temperaments, personality clashes, and agendas and varying degrees of affection or tolerance for each other. The uncle for whom Oliver worked is a bit more prominent and very well drawn, as are Lila’s friend Julie and Ash’s friend Luke. Overall, this was an enjoyable, engaging story. I've been a huge fan of Nora Robert's since the 1980's. She's gone so many different ways with her stories. 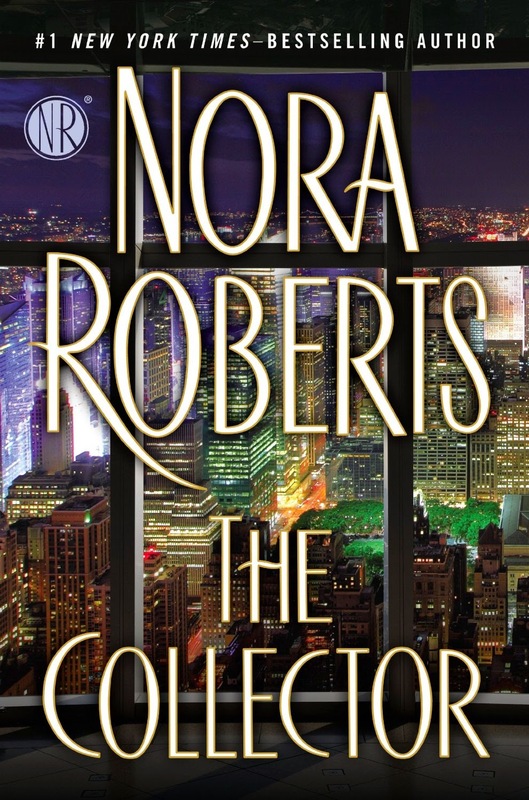 I enjoyed reading your review of THE COLLECTOR! She's such a versatile writer, isn't she? Laurie, I'm glad you enjoyed the review. I'm also a big fan of Nora Roberts. I just started reading her last year and have enjoyed everything I've read so far. The only thing holding me back are that there are so many connected or books in a series and I prefer reading in order. Catslady, I also discovered Nora later than most, starting with the J.D. Robbs, reading through those in order (I share your preference for that) and then moving over to the NR books. I also the Chesapeake Quartet, The Sign of 7 trilogy, The Search, Tribute, and Birthright. Oh wow! You really grabbed me here so I had to drop everything to say how much I would love to read this book. I am going to add it to my Wish List right now. Hiya Dishies! Great review, Nancy! I've had my eyes on this one since I read an excerpt in the back of Shadow Spell a couple of weeks ago. The bit I read had bits of Rear Window going on which I thought was great. I really like artist heroes - it's interesting, apparently they're a romance no-no. Will definitely give The Collector a go. I like artist heroes too, Anna and the Rear Window connection jumped out at me immediately (awesome movie!). Shadow Spell is in my bag and ready for some reading and relaxation at the beach. I loved the first book in the trilogy and am looking forward to this second one! PJ, don't think I enjoyed SS quite as much as the Dark Witch but it's definitely a good read. Hope you have fun at the beach! Anna, thanks! I also enjoy artist heroes. Seth Quinn in Chesapeake Blue is great, and I like Ash here. The two artists thing did stop me for a minute, but then I shrugged and went on. I've enjoyed the O'Dwyer books (used to know someone whose middle name was O'Dwyer), but The Sign of 7 remains my favorite of her paranormal series.